Just in the past two months I've traveled to Arizona, Florida, Texas, Kentucky, and now I'm off to LA and then back home to Kentucky again for the holidays. Side note: I should reeeally figure out how frequent flyer miles work, haha. Since travel is becoming such an integral part of my job, I've learned to find sustainable ways to adapt my healthy lifestyle while on the road. That way my body won't crash and burn every time I'm on an airplane (figuratively speaking, let's hope). I'd be lying if I didn't say travel stresses me out. But, it's also exciting, and I can't get enough! So, I've compiled a list of tips that have helped me that I hope can help you too! 1. Commit to your morning & nightly rituals no matter where you are on the map. If you typically wake up, meditate, and drink coffee, then try to keep up with this routine when traveling. 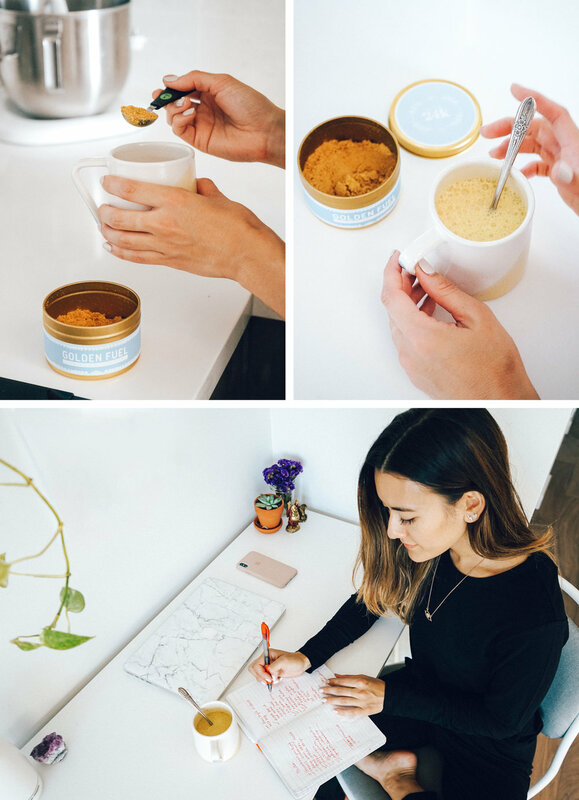 Or say you like to wind down in the evenings with a cozy turmeric latte (my favorite blend here) and journal about your day, then do it. Hold space for your daily rituals, so you can start and end your days with strong intentions. It will help keep some sort of structure, so you can stay energized amongst the holiday festivities. It also opens up a chance to bond with family and friends over your healthy habits! ^ Wearing ThirdLove's Organic Cotton Jogger Set - perfect for holiday gifting. I already bought a set for someone who shall not be named, because they read my blog. 2. Pack only what you need. To put it simply, more things = more stress. I've been slowly transitioning into a more minimal lifestyle (read about that here), so I've become a pro at packing light and pulling together a chic n' versatile wardrobe. No matter what, I always make sure to pack things I feel comfortable in. ^ Wearing ThirdLove's Seamless Lounge Bra + Organic Cotton Jogger Set. You bet I'll be wearing these cozy babes on the airplane. 3. Incorporate essential oils into your daily life to combat anxiety, nausea, and stress. I wish I knew about the healing powers of essential oils when I was in high school. Now when I travel, I make sure to bring a peppermint oil blend for any car sickness or travel headaches and lavender to calm my nerves when I'm feeling anxious (especially on airplanes). 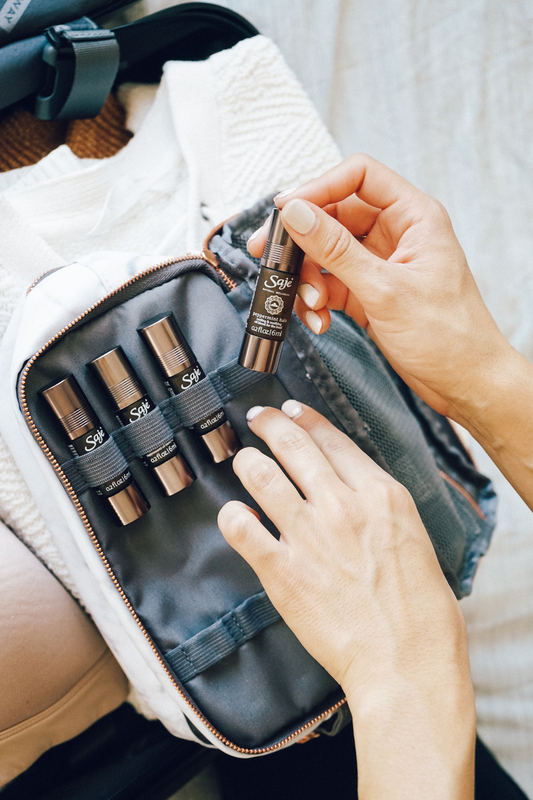 I have this little 'pocket farmacy' from Saje that is the perfect starter kit for anyone new to essential oils. 4. Eat Slowly & ENJOY! Please, please, *please* don't feel guilty about all of the goodies you eat with your loved ones. Eat what makes your body feel good, and just be mindful of which foods hurt your stomach. I am sadly (and inconveniently) on the elimination diet through the new year, which is keeping me from going ham on desserts. But, you betcha I'll be indulging in my raw vegan cheesecake! No matter what, give love and honor your family and friends surrounding you. Treasure the time you have with them, and do your best to stay present. Avoid conversations about politics, controversial hot topics, and differing religious views. The holidays are a time to come together and share respect for one another. ^ Wearing ThirdLove's Organic Cotton Jogger Set. Be sure to check out their Holiday Gift Guide filled with easy stocking stuffers, gift sets, more splurge-worthy items and more. Wishing you safe travels & happy holidays! This post was sponsored by ThirdLove. All thoughts and opinions are always my own. Thank you for supporting me and the brands I love!